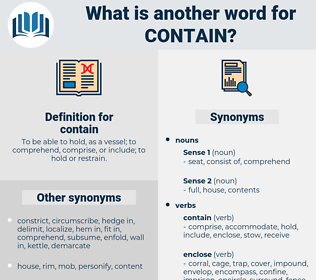 What is another word for contain? To be able to hold, as a vessel; to comprehend, comprise, or include; to hold or restrain. Restraining, countering, halting, holding, Stemming, arresting. documents, are, formulated, comprise, Comprising, consist, involve, cover, hold, indicate, carry, exist, enclose, include, constitute, have, understand, anticipate, embody, feature, appear, contemplate, reflect, present, represent, possess, pose, foresee, describe, envisage. reproduced, lay, comprise, consist, restrain, involve, constrain, curb, covering, confine, circumscribe, stem, rein, cover, curtail, stop, hold, counter, halt, indicate, counteract, carry, exist, suppress, enclose, deter, include, mitigate, retain, constitute, have, understand, stifle, specify, anticipate, prevent, embody, feature, disclose, discourage, embrace, outline, insert, appear, contemplate, inhibit, stipulate, stipulates, be, accompany, reflect, convey, detain, present, sustain, represent, dampen, absorb, Gave, Gives, combat, possess, alleviate, delineate, pose, foresee, describe, capture, envisage. encourage, liberate, permit, allow, continue, help. exclude, release, free, let go, disbelieve. except, bar, debar, vent, leave, preclude, deny, reject, ban, prevent, air, mislay, misplace, omit, eliminate, refuse, express, prohibit, take out, unleash, rule out, lose, loose. But six of them, which present a slight difference from the rest in the brand, have been opened, and have been found to contain a red wine instead of champagne.
" I've been asking her to marry me," said Stanley, who could contain it no longer. 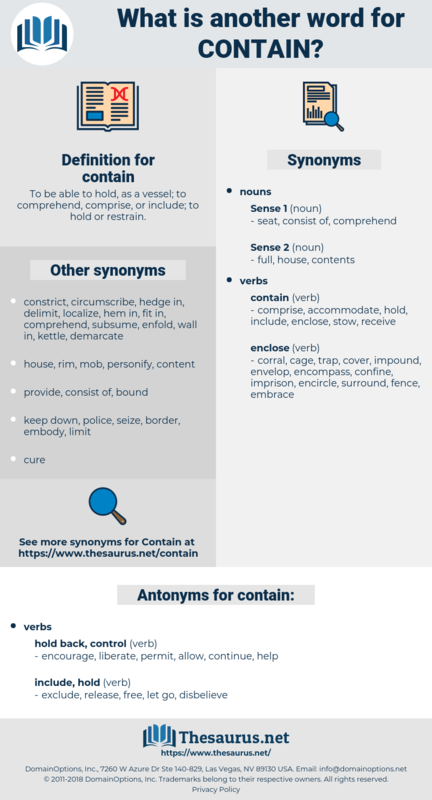 centime, contadino, canton, canteen, cismontane, coumadin, camden, canadian, cachinnation, cynodon, comedown, condone, continuum, comedian, common time, commutation, conidium, condom, continue, count down, cymatium, committeeman, cognation, common thyme, commendation, countdown, condominium, commotion, connotation, count on, contemn, continuo, come down, centimo, commination, comedienne, condition, count noun, cimetidine, Canada Anemone, cementum, condemn, cognition, committeewoman, county town. confine, hold in, retain, enclose.